DNS Accountants is a renowned accounting, tax planning and consulting service in the UK. Ever since we launched ourselves in 2005, we have been of service to thousands of businesses across the nation. Based on our expert services, we have gained wide popularity and respect among our clients. DNS Accountants has unmatched expertise in being of great help to start-ups, freelancers; owner managed businesses, contractors, and construction industry clients. For small businesses working in a wide range of sectors, our highly skilled Small Business Accountants in Stanmore and nearby areas offer expert accounting services. With our customized Online Accounting Software, we can take full control of your finance and business and present you with an accurate picture of your finances every time. We offer to help you in every way we can and will give best possible consultancy services to aid your business growth. Our experienced tax accountants in Stanmore offer timely tax planning so that you can maximize your tax savings. With the best IT contractor accountants, we guarantee to maximize the profits of contractors and freelancers. Our IT Contractor Accountants will make sure that you comply with the IR35 legislation and offer a 100% satisfaction guarantee. You can also take advantage of our adept Online Contractor Accountants who will keep your records updated and organized, advise you on your contract status, advise you about which category your subcontractors fall into and even verify them on your behalf with the HMRC. Our IT Contractor Accountants will also provide you with a CIS compliant payroll. Chartered Accountants in Stanmore are also available who will guide you through every step regarding your business and finance. DNS Accountants has left its marks in the lives of over two thousand clients spread across the UK, and one such place is Stanmore. Stanmore is an upcoming business hub with many start-ups and small businesses coming up there, driving the region’s economic growth. With our help start-ups, small businesses, freelancers and construction industry contractors have ensured that the businesses in Stanmore see only growth. DNS’s Small Business Accountants in Stanmore, with all our expertise, are a significant advantage to our clients in the area. Regardless of whichever business you run, Our accountants And Taxation Experts give utmost importance to relieving you of the stress of taxation, finance, and other accounting areas. Our tax accountants in Stanmore work especially hard for start-ups and small businesses, as these entities need that additional care. We strive to reduce tax liabilities to the maximum possible level and in turn, increase your business profits. Tax planning is no easy task, but our tax accountants will make the job very easy for you. Consultation and advisory services with tax planning are offered to clients in need, and even the extent of these can be adjusted according to your requirements. We are always eager to help with your business in the construction industry. We will keep you updated on the progress of your work while keeping all your records updated. 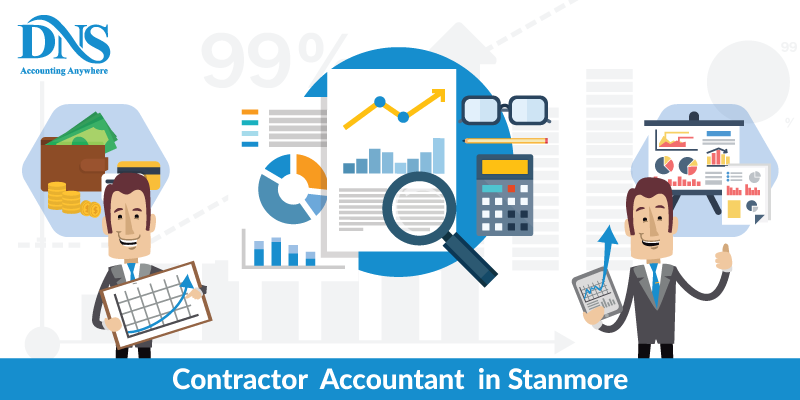 These Contractor Accountants will help you to sort out your subcontractors and to verify them with the HMRC upon your request. Under this service, we ensure free access to the world’s leading business growth and marketing systems for our clients. One of the most beneficial services offered by DNS Accountants is the Year End Accounts service. For some, if not all companies, the task of preparing the accounts at the end of the year is a nightmare. The Companies House and the HMRC issue deadlines for the submission of the end of the year accounts and getting these accounts ready in time for these deadlines is no easy task. This is why we have put together our team of accountants who have all the experience and skills required to do that job for you just perfectly. We strive to take the steam off you and also to suggest improvements that will help your business grow. We will come up with accurate accounts and Corporate Tax Returns. We are also specialized in preparing sole trader accounts as well as partnership trader accounts. Then comes rental accounts and dormant accounts. We will leave no aspect unattended! It is another service of ours which we have particularly specialized in. Management Accounting plays a critical role in the growth of business. Frequent preparation of Management Accounts is necessary for every business to ensure that they are growing and not failing. They are a crucial element of the success story of a company because they help you to understand the performance of the business, gives you a cash flow forecast, reveal margins, costs and break-even points which will contribute to making an ideal financial decision, and to recognize the area of your business that is not contributing to the betterment of your company or is hindering its growth. So now you see why preparing Management Accounts is important. Do not fret; we will do it for you. One of DNS Accountants’ particular interest lies in assisting start-ups and small businesses. Starting a business can be a mind-numbing process. Your plan needs to be foolproof, and even so, implementing it can be a nightmare. This is why DNS Accountants have put together a task force for the Business Start-up Service. When you get hung up with the recruitment and sales aspects of the business, our Small Business Accountants in Stanmore will take care of all the financial aspects. Our experts will guide you in all the areas you need help with in the early stages of your start-up and let your business grow. Our particular services include Accounting Compliance and Tax Advice, Business Growth System, a Dedicated Account Manager and a Smart Cloud Software. You will never have to decide on your own; our expert accountants are here for you. DNS Accountants has evolved over the years to become a well known brand name amongst our clients and young entrepreneurs. This happened because of our team which consists of very gifted members, handpicked by us. Of course, this helped us to extend our helping hands to all those in need. A few out of the many places our services are extended to are Edgware, Pinner, and Harrow. We guarantee our service to you with 100% Satisfaction, which means that you do not have to pay if you are not satisfied!